Pegasus relief in cast iron. The propeller section has been cut away from this relief. Unlike most of Fredericks' works which were cast in bronze or aluminum, this Pegasus relief is cast iron. Two similar reliefs in plaster of the same theme can be seen on the east wall in the Sculptor's Studio. The piece exhibits some surface deterioration as it was outside at the Frederick's home in Birmingham, Michigan. Residue of bird droppings still can be seen on the surface. 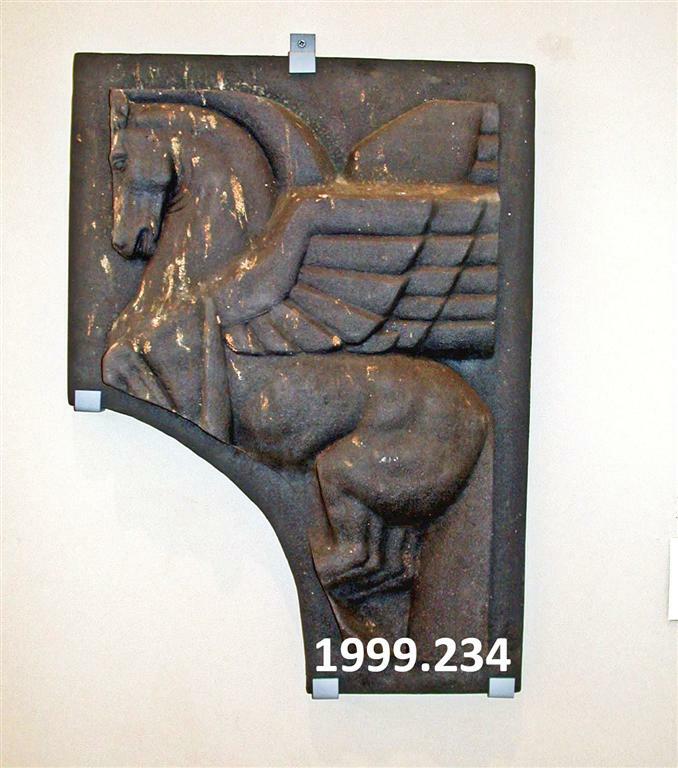 Fredericks, Marshall M., 1908-1998, “Pegasus, Relief, [Cast Iron],” Marshall M. Fredericks Sculpture Museum, accessed April 20, 2019, http://omeka.svsu.edu/items/show/5514.